The Brecon Beacons. Surely the middle of Wales? Think again. At less than an hour into Wales, The Griffin is not as far as you think. From London the road is motorway or dual carriageway for all but the last 25 miles. The journey from the Hogarth roundabout has even been done in no more than two and a quarter hours. But you should generally allow about three hours from London, an hour and a quarter from Bristol and an hour from Cardiff. We do have plenty of parking space at The Griffin. Do watch the speed cameras. Under the driving influence of the notorious Mr. Brunstrom, Wales' roads became more filmed than the Pinewood backdrops. The cameras are in mobile white vans, usually in lay-bys or on bridges over motorways and pick you up from a long way off. You've been warned. It is possible to reach us by train with a fast service to Newport from London and Bristol but we are some distance from our nearest station, making it neither easy nor cheap. Abergavenny is our nearest station, but it is a 40 minute drive from us. You can hire a car from the station through Whittal Williams. If you're coming to the UK from abroad or from the north of Ireland, it is worth you knowing where we are in relation to airports. We're about 90 minutes from each of Bristol, Birmingham and Cardiff airports, where you could hire cars. Heathrow is less than three hours from us, and Stansted and Gatwick will be 45 minutes more. From London and Bristol, take the M4 across the Severn Bridge, leaving at Exit 24 for Monmouth. Take the A449, exiting at Raglan for the A40 and Abergavenny. Take the A40 through Abergavenny and Crickhowell. At the roundabout before Brecon, take the 3rd exit for the A470 for Hereford. 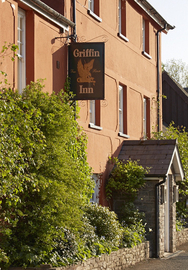 The Griffin is on the left hand side after four miles at the sign for Felin Fach. 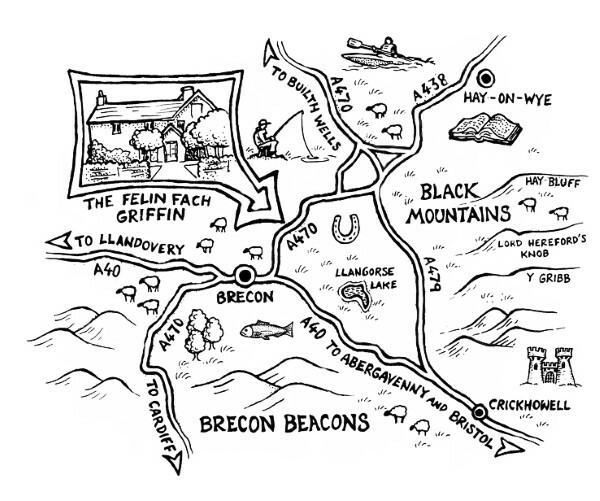 From Cardiff, take the A470 north from the Coryton interchange all the way to Brecon. At the roundabout take the fourth exit for Abergavenny and Hereford. After three miles, and the next roundabout, take the second exit for the A470 for Hereford. The Griffin is on the left hand side after four miles. To reach it, take the left for Felin Fach.